You know ho w the saying goes: “Health is wealth.” Well, according to one of the largest banks in the country, that’s actually true. Their findings showed that 81% of respondents felt that their goals were much easier to achieve when their finances were in order, with 70% of respondents stating that good financial health had a positive impact on their physical health. Because engaging in physical activities and fitness routines require you to also engage in emotional and mental training, it’s no wonder why finance experts recommend physical activity as a way to get your life in order, debt and money management included. Climbing out of debt often seems like an insurmountable mountain when you look at it as one big problem; the same goes for losing large amounts of weight or completely changing your eating habits. This is normal, and it’s something both fitness and finance experts recommend to avoid doing. Take large issues in small bites and set small, actionable goals that you know you can accomplish. In this regard, it helps to combine your fitness and financial goals in order to make them work together for you. Start by committing to being mindful, both of what you eat and what you buy. Then, get rid of clutter, both in your personal life and in your finances. Avoiding purchases that you know you don’t really need will help you begin to cultivate the same habits regarding unhealthy foods or costly supplements that are more harmful than they are good. There’s no doubt that financial stress can lead to other health problems. In fact, 30% of Americans report to feeling “constantly” stressed out about money. What this type of stress does is prevent you from being able to effectively achieve goals and give 100% of your physical and emotional energy into doing your job, or jobs, adequately in order to pull yourself out of debt. Focusing on your physical health, therefore, can help with this problem as it is a great way to relieve stress, clear your head, and ensure that the financial pressure you feel isn’t damaging your body in irreparable ways. If you can focus on cultivating a semi-strict diet and exercise routine, you’ll find that organization carrying over into other areas of your life. Your body will feel great, your mind will be clear and you’ll be able to sit down, craft a budget and feel motivated to stick to it. Making an effort to organize your debt is easy when you learn how to optimize your spending habits, just as you would optimize your eating habits and exercise routine. 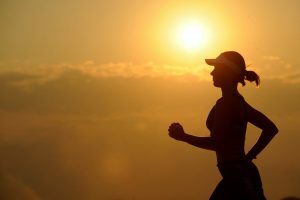 Doing so will help ensure that your financial health is in just as good shape as your physical health, and seeing as both are directly related to each other, combining both goals into one is not only practical, but it’s a great way to build physical and mental strength that will carry over into every area of your life.